According to state government agencies, 6000 families are facing eviction without prospect of rehabilitation. CHENNAI: In a few weeks, right in the middle of the school year, thousands of families will be shunted out from ‘objectionable areas’ without a resettlement plan in sight. There indeed are Resettlement Action Plans (RAPs) ready for two slums, but both do not figure in the list of evictions in the first phase that is set to begin by the end of the month. Various State government agencies had jointly identified 6,000 families who were to be evicted and sent to various resettlement colonies in the outskirts of the city. However, as an RTI reply revealed, Tamil Nadu Slum Clearance Board has prepared RAPs for only the slums in Pallavan Salai and Navalar Nedunchezhian Salai — neither of which is in the first list prepared for evictions. “Pushing people to the periphery in the name of rehabilitation by itself is questionable. Without RAPs and social impact assessments, the situation is further worsened and their vulnerabilities, higher,” said Vanessa Peter, policy researcher at Information and Resource Centre for the Deprived Urban Communities (IRCDUC), a community-centric information hub. The RTI query was filed by a volunteer with the organisation. “Some communities have several domestic workers, some have several carpenters. So the resettlement packages offered need to be tailor-made based on the profiles, there cannot be a one-size-fits all approach,” she added. 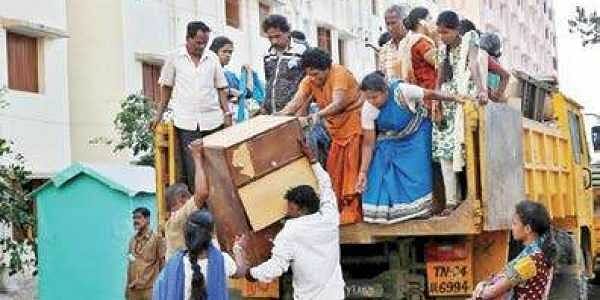 While a total of 14,257 families were identified by the slum board as dwellers on objectionable land, around 6,000 families in 15 locations have been identified by the Greater Chennai Corporation and the Public Works Department along with the Tamil Nadu Slum Clearance Board for evictions set to begin this month. However, considering the magnitude, residents in informal settlements where evictions are due, said that they have had little interaction with officials, whatsoever. “Questions were limited to officials asking us to produce ration cards and whether our names were on the voters’ list. We were asked to pack our bags about nine months ago but nothing happened. We now have no idea where we would be taken to or when. No formal notice has been served,” said Malarvizhi P, a domestic worker, in Muthumariamman Koil street in Arumbakkam, that is set to be evicted. A senior slum board official cited the Madras High Court’s order late last year which had expedited the process of evicting 55,000 ‘encroachers’ as the reason for speeding up the eviction. However, while following this directive, the implementing agencies have failed to follow procedures. For instance, many of the families were not issued legal notices, which is mandatory under the Tamil Nadu Land Encroachment Act 1905, the Tamil Nadu Public Premises (Eviction of Unauthorised Occupants) Act 1975, and the Tamil Nadu Protection of Tanks and Eviction of Encroachment Act 2007. The official said that a revalidation process would be carried out instead by the implementing agencies that would cover ‘most aspects’. When contacted, a senior official of the Chennai Rivers Restoration Trust (CRRT) said that the trust has little role in the eviction process that was due. “The slum board is the implementing agency,” the official said.